Amateur radio, often called ham radio, is a hobby enjoyed by many people throughout the world. An amateur radio operator, ham, or radio amateur uses two-way radio to communicate with other radio amateurs, for recreation or self-edification. The origin of the word “ham” is unknown. As of 2004 there were about 3 million hams worldwide with about 700,000 in the USA, 600,000 in Japan, 140,000 each in South Korea and Thailand, 57,000 in Canada, 70,000 in Germany, 60,000 in UK, 11,000 in Sweden, and 5,000 in Norway. The International Telecommunication Union (ITU) governs the allocation of communications frequencies world-wide, with participation by each nation by representation from their communications regulation authority. National communications regulators have some liberty to restrict access to these frequencies, or to award additional allocations as long as radio services in other countries do not suffer interference. In some countries, specific emission types are restricted to certain parts of the radio spectrum, and in most other countries, International Amateur Radio Union (IARU) member societies adopt voluntary plans to concentrate modes of transmission in specific frequency allocations within IARU guidelines, to ensure most effective use of available spectrum. Many countries have their own national (non-government) amateur radio society that coordinates with the communications regulation authority for the benefit of all Amateurs. The oldest of these societies is the Wireless Institute of Australia, formed in 1910; other notable societies are the Radio Society of Great Britain, the American Radio Relay League, and Radio Amateurs of Canada. In most countries, amateur radio operators are required to pass a test in order to be licensed. In return, hams are granted operating privileges in allocated segments of the entire radio frequency spectrum using a wide variety of communication techniques. Once licensed, the radio amateur is issued a callsign by its government. This callsign is unique to the operator and is often a source of pride. The holder of a callsign uses it on the air to legally identify the operator or station during any and all radio communications. In many countries, amateurs are required to pass an examination to demonstrate technical knowledge, operating competence and awareness of legal and regulatory requirements, in order to avoid interference with other amateurs and other radio services. In the majority of countries, there are a series of exams available, progressively more challenging and granting progressively more privileges in terms of frequency availability, power output, and permitted experimentation. In many countries, amateur licensing is a routine civil administrative matter, with considerable worldwide improvement in the past 15 years. In some countries, however, amateur licensing is either inordinately bureaucratic (e.g. India), or amateurs must undergo difficult security approval (e.g. Iran). A handful of countries, currently only Yemen and North Korea, simply do not permit their citizens to operate amateur radio stations, although in both cases a handful of foreign visitors have been permitted to obtain amateur licenses in the past decade. A further difficulty occurs in developing countries, where licensing structures are often copied from European countries and annual license fees can be prohibitive in terms of local incomes. This is a particular problem in Africa and to a lesser extent in poorer parts of Asia and Latin America. Small countries or those with weak administrative structures may not have a national licensing scheme and may require amateurs to take the licensing exams of a foreign country in lieu. Amateur licensing in theUnited Statesserves as an example of the way some countries award different levels of amateur radio licenses based on knowledge and telegraphy skill. TheUnited Statessystem has evolved into three-levels of license. The entry-level license, known as Technician, is awarded after an applicant successfully completes a 35-question multiple choice written examination. The license grants operating privileges on all bands above 50 MHz. A Technician who passes a 5 word-per-minute Morse code test is further granted privileges in portions of the 10-, 15-, 40-, and 80-meter amateur bands. 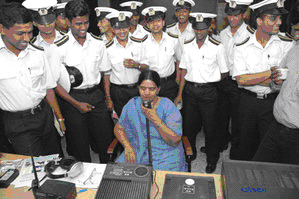 The next grade, known as General, requires passage of the Technician test, the 5 word-per-minute telegraphy test, as well as a 35-question multiple-choice General exam. General-class licensees are granted privileges on portions of all amateur HF bands, in addition to the Technician privileges. The topUSlicense class is Amateur Extra. The Extra class license requires the same tests as General plus a third multiple-choice exam. This exam has 50 questions. Those with Amateur Extra licenses are granted privileges on allUSamateur bands. Commercial and military use of Morse Code radiotelegraphy has almost completely disappeared. As a result, there is a growing demand for Morse testing to be dropped from amateur radio licensing requirements. Until recently, amateurs operating in the short-, medium-, or longwave bands were required by international regulation to pass a Morse code telegraphy exam. At the 2003 World Radio communication Conference (WRC-03) this requirement was made optional leaving it up to individual nations to decide whether or not Morse testing should be required. As a result, many nations, e.g. Canada, Japan, many nations of the European and Oceania, have dropped the requirement while others have yet to make a decision (e.g. USA, India, China, most Arab and Caribbean countries). Presently countries dropping the requirement represent 12% of world Amateurs. While some countries are dropping the requirement for an entry level license, countries like Japan chose to maintain the telegraphy test requirement for it’s highest class license. U.S. Amateurs recently commented in favour of keeping the telegraphy test for at least the highest class license by a 55% to 45% margin  when answering a request by the FCC to respond to a Notice of Proposed Rule making (RM 05-235). The FCC proposal seeks to remove the telegraphy test requirement for Amateur Radio altogether. Morse code is normally sent on the ham bands by keying an unmodulated single-frequency transmission on and off. This communication mode is referred to as CW (Continuous Wave). Statistics show Morse Code use (CW) continues to be the second most popular mode on Amateur Radio with use by Amateurs averaging about 30-35%. In contrast to most commercial and personal radio services, most radio amateurs are not restricted to using type-approved equipment, allowing them to home-construct or modify equipment in any way so long as they meet national and international standards on spurious emissions. As noted, radio amateurs have access to frequency allocations throughout the RF spectrum, enabling choice of frequency to enable effective communication whether across a city, a region, a country, a continent or the whole world regardless of season or time day or night. The short wave bands, or HF, can facilitate worldwide communication, the VHF and UHF bands offer excellent regional communication, and the broad microwave bands have enough space, or bandwidth, for television transmissions and high-speed data networks. Although permitted power levels are moderate by commercial standards, they are sufficient to enable cross-continental communication even with the least effective antenna systems, and world-wide communications at least occasionally even with moderate antennas. Power limits vary from country to country, for the highest license classes for example, 2 kilowatts in most countries of the former Yugoslavia, 1.5 kilowatts in the United States, 1 kilowatt in Belgium, 750 watts in Germany, 400 watts in the United Kingdom and 150 watts in Oman. Lower license classes are usually restricted to lower power limits; for example the lowest license class in the UK has a limit of just 10 watts. Some suggest that the amateur portion of the radio spectrum is like a national park: something like the Yosemite of natural phenomenon. Through the licensing requirement, radio amateurs become like trained national park guides and backpackers. Where the backpackers and guides know about the beauty of the parks as well as the rules of engagement with wildlife in the park system, radio amateurs learn to appreciate and respect the beauty of the very limited electromagnetic space and the rules of engagement of human interaction within that space. In contrast, all of humanity benefits from the radio spectrum’s existence, although it can not actually be seen. What does one do with amateur radio? An amateur radio operator engaging in two-way communications. Amateur radio operators enjoy personal two-way communications with friends, family members, and complete strangers, all of whom must also be licensed. They support the larger public community with emergency and disaster communications. Increasing a person’s knowledge of electronics and radio theory as well as radio contesting are also popular aspects of amateur radio. A good way to get started in amateur radio is to find a club in your area to answer your questions and provide information on getting licensed and then getting on the air. If you are in the U.S., you can find a club near you by going to the American Radio Relay League‘s Affiliated Club Search page. Radio amateurs use a variety of modes of transmission to communicate with one another. Voice transmissions are the most common way hams communicate with one another, with some types of emission such as frequency modulation (FM) offering high quality audio for local operation where signals are strong, and others such as single side band (SSB) offering more reliable communications when signals are marginal and using smaller amounts of bandwidth. Radiotelegraphy using Morse code remains surprisingly popular, particularly on the shortwave bands and for experimental work on the microwave bands, with its inherent signal-to-noise ratio advantages. Morse, using internationally agreed code groups, can also facilitate communications between amateurs who do not share a common language. Radiotelegraphy is also popular with home constructors as CW-only transmitters are simple to construct when compared to voice transmitters. The explosion in personal computing power has led to a boom in digital modes such as radio teletype, which a generation ago required cumbersome and expensive specialist equipment. Hams led in the development of packet radio, which has since been augmented by more specialized modes such as PSK31 which is designed to facilitate real-time, low-power communications on the shortwave bands. Other modes, such as the WSJT suite, are aimed at extremely marginal propagation modes including meteor scatter and moonbounce or Earth-Moon-Earth (EME). Similarly, fast scan amateur television, once considered rather esoteric, has exploded in popularity thanks to cheap camcorders and good quality video cards in home computers. Because of the wide bandwidth and stable signals required, it is limited in range to at most 100 km (about 62 miles) in normal conditions. Most of the modes noted above rely on the simplex communication mode, that is direct, radio-to-radio communication. On VHF and higher frequencies, automated relay stations, or repeaters, are used to increase range. Repeaters are usually located on the top of a mountain or tall building. A repeater allows the radio amateur to communicate over hundreds of square miles using only a relatively low power hand-held transceiver. Repeaters can also be linked together, either by use of other amateur radio bands, by wireline, or, increasingly via the Internet. While many hams just enjoy talking to friends, others pursue interests such as providing communications for a community emergency response team; antenna theory; communication via amateur satellites ; disaster response; severe weather spotting; DX communication over thousands of miles using the ionosphere to refract radio waves; the Internet Radio Linking Project (IRLP) which is a composite network of radio and the Internet; Automatic Position Reporting System (APRS), which is a system of remote positioning that uses GPS; Contesting; the sport of Amateur Radio Direction Finding; High Speed Telegraphy; or low-power operation. 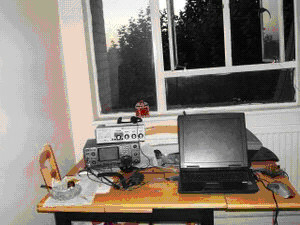 Most hams have a room or area in their home which is dedicated to their radio and ancillary test equipment, known as the “shack” in ham slang. In times of crisis and natural disasters, ham radio is often used as a means of emergency communication when wire line and other conventional means of communications fail. Recent examples include the 2001 attacks on the World Trade Center in Manhattan, the 2003 North America blackout and Hurricane Katrina in September, 2005, where amateur radio was used to coordinate disaster relief activities when other systems failed. On September 2, 2004, ham radio was used to inform weather forecasters with information on Hurricane Frances live from the Bahamas. On December 26, 2004, an earthquake and resulting tsunami across the Indian Ocean wiped out all communications with the Andaman Islands, except for a DX-pedition that provided as a means to coordinate relief efforts. The largest disaster response by U.S. amateur radio operators was during Hurricane Katrina which first made landfall as a Category 1 hurricane just north of Miami,Florida on August 25, 2005. More than a thousand ham operators from all over the U.S.converged on the Gulf Coast in an effort to provide emergency communications assistance. In the United States, there are two methods of organizing amateur radio emergency communications. The Amateur Radio Emergency Service (ARES), sponsored by the ARRL, and the Radio Amateur Civil Emergency Service (RACES), usually organized by municipal or county governments. RACES authorization comes from Part 97.407 of the FCC regulations. In the United Kingdom, RAYNET, the Radio Amateur Emergency Network, and the RSGB, provide the organisational backbone of their amateur radio emergency communications groups. In New Zealand the New Zealand Association of Radio Transmitters (NZART) provides the AREC – Amateur Radio Emergency Communications (formerly Amateur Radio Emergency Corps) in the role. They won the New Zealand National Search and Rescue award in 2001 for their long commitment to Search and Rescue in NZ. Amateurs are often professionally involved in areas which complement their hobby, such as electronics, emergency services, or aviation. This often sees hams as being at the forefront of the development of ‘STSP’ (Short Term Special Purpose) repeater systems and other complex radio linking systems able to easily be inserted by trampers or aircraft into a search area. Being able to provide VHF or UHF radio into an emergency or disaster area means that teams on the ground can use relatively common and portable handheld radios to liaise with base, or with other agencies. VHF-based communications supported by cross banding or STSP repeaters are gradually replacing portable HF systems because of their flexibility, and the relative portability of their antenna and power systems. Many amateurs enjoy trying to contact stations in as many different parts of the world as they can on shortwave bands, or over as great a range as possible on the higher bands, a pursuit which is generally known as DXing. Traditionally radio amateurs exchange QSL cards with other stations, to provide written confirmation of a conversation (QSO). These are required for many amateur operating awards, and many amateurs also enjoy collecting them simply for the pleasure of doing so. The number of operating awards available is literally in the thousands. The most popular awards are the Worked All States award, usually the first award amateurs in the United States aim for, the Worked All Continents award, also an entry level award on the shortwave bands, and the more challenging Worked All Zones and DX Century Club (DXCC) awards. DXCC is the most popular awards programme, with the entry level requiring amateurs to contact 100 of the (as of 2005) 335 recognized countries and territories in the world, which leads on to a series of operating challenges of increasing difficulty. Many awards are available for contacting amateurs in a particular country, region or city. Certain parts of the world have very few radio amateurs. As a result, when a station with a rare ID comes on the air, radio amateurs flock to communicate with it. Often amateurs will travel specifically to a country or island, in what is known as a DX-pedition, to activate it. Big DX-peditions can make as many as 100,000 individual contacts in a few weeks. 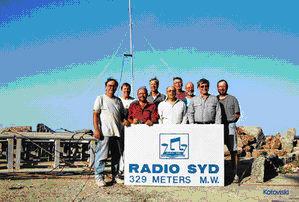 A group of amateur radio operators during DXpedition to The Gambia in October 2003. Many amateurs also enjoy contacting the many special event stations on the air. Set up to commemorate special occurrences, they often issue distinctive QSLs or certificates. Some use unusual prefixes, such as the call signs with “96” that amateurs in the US State of Georgia could use during the 1996 Atlanta Olympics, or the OO prefix used by Belgian amateurs in 2005 to commemorate their nation’s 175th anniversary. Many amateurs decorate their radio “shacks” with these certificates. Some hams enjoy attempting to communicate distances with very low power. Signals on the order of 5 watts or less are heard all over the world by these QRP (low power) operators. Some amateurs never use more than a few watts of transmit power. By setting up efficient antennas and using expert operating techniques, they can make regular international contacts and get immense satisfaction from their achievements. Contesting is another activity that has garnered interest in the ham community. During a period of time (normally 24 to 48 hours) a ham tries to successfully communicate with as many other amateur radio stations as possible. Different contests have different emphases, with some aimed at chasing DX stations, or stations in a particular country or continent. In some the focus is on operating a station running on emergency power (i.e. portable generators or batteries) to contact other such stations (Field Day), to simulate hurricane or other emergency disaster conditions. In some contests all operating modes are permitted, while others may be limited to single mode such as voice or CW (Continuous Wave, more commonly called Morse Code). Often, hams join together to form contest teams. Many hams enjoy casually gaining a few points in a contest, other chasing rare stations who are more likely to make an appearance in these events, others try to set the best possible score using a very limited home station. The serious competitors spend a lot of time in training, spend a lot of money in building up a world class station, and will often travel to a rare country or prime geographical location in order to win. Amplitude Modulation is a mode and an activity that enjoys status as a nostalgic specialty on the shortwave ham bands (1.8 – 29 mHz, or just above AM broadcast band to just beyond the CB band), and draws a wide range of enthusiasts from rock star Joe Walsh, WB6ACU, to the Federal Communications Commission’s Riley Hollingsworth, K4ZDH. Conversations are often configured as “round tables” where several participants spend time developing and presenting their thoughts in a storytelling fashion. Listeners reflect on each transmission much as families did when they listened to the old wooden floor console in the early days of radio. Many find this style of communicating more satisfying than the rapid-fire style of operating that can seem rushed and shallow by comparison. Much of the conversation revolves around do-it-yourself experimentation, repairs, and restoration of popular, vintage vacuum-tube equipment, which has been rising in value because of nostalgic demand. But contemporary transceivers also include AM among modes, and can sound quite good on transmit and receive as a way to encourage a newcomer to check in and introduce themselves. 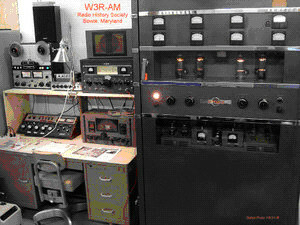 Frequencies to look for AM activity include 1885, 1930, 3885, 7285, 14286 and 21425, and often include “special event” stations using unique call signs, such as W3F,  K3L  and W3R , The Radio History Society’s station pictured at right. The sound and visual impact of vintage radio are powerful lures. While many radio amateurs use use VHF or UHF frequencies primarily for local communications, other amateurs build up more sophisticated systems to communicate over as wide a range as possible. Despite the common misconception of ‘line of sight’ a VHF signal transmitted from a walkie-talkie (or as hams call it a Handi-talkie or HT for short) will typically travel about 5-10 km depending on terrain, and with a low power home station and a simple antenna to around 50 km. With a large antenna system like a long yagi, and higher power (typically 100 or more watts) contacts of around 1000 km are common. Such operators seek to exploit the limits of the frequencies’ usual characteristics looking to learn and experiment with radio technology. They also seek to take advantage of “band openings” where due to various natural occurrences, radio emissions can travel well over their normal characteristics. There are numerous causes for these band openings and many hams listen for hours to take advantage of their rare manifestations, which may be of fleeting duration. Some openings are caused by intense excitement of the upper atmosphere, known as the ionosphere. Other band openings are caused by a weather phenomenon known as an inversion layer, where cold air traps hot air beneath it, which forces the radio emission to travel over long weather layers. Radio signals can travel hundreds or even thousands of kilometres due to these weather layers. Others bounce their signals off the moon (see moonbounce). The return signal is heard by other hams who have equipment suitable for EME (earth-moon-earth) operation, as it is known. The antennas normally required can range from parabolic dishes of up to 10 metres in diameter to an array of directional (usually of the yagi type) antennas. Digital signal processing has revolutionised weak signal communications by radio amateurs. Using freely available software tools and modern computers, radio amateurs can achieve results they would only have dreamed of only 10 years earlier. For example, reflecting signals off the moon, once the realm of only the very best equipped amateur stations, has become feasible for much more modest stations. Instead of a large dish or an array of 8 antennas, it has become possible for stations with 400 to 1000 watts transmit power and a single well designed antenna to make contacts using moonbounce. Licensed amateurs often take portable equipment with them when travelling, whether in their luggage or fitted into their cruising yachts, caravans or other vehicles. On long-distance expeditions and adventures such equipment allows them to stay in touch with other amateurs, reporting progress, arrival and sometimes exchanging safety messages along the way. Many hams at fixed locations are pleased to hear directly from such travellers. From in a yacht in mid-ocean or a 4×4 inside the Arctic Circle, a friendly voice and the chance of a kind fellow-enthusiast sending an e-mail home is very well received. See maritime mobile amateur radio for further details about operation in this way at sea. There is a sub-culture of amateur radio operators who concentrate on building and operating radios that operate at low power. This activity goes by the name QRP which is an international Q code for “reduce power”. QRP operators use less than 5 watts output on Morse Code and 10 watts on voice. Operators can carry small portable QRP tranceivers on their person. An international organization that promotes this activity is called the QRP Amateur Radio Club International  (QRPARCI). Many records for low power communications over great distances have been set using slow speed telegraphy sent and received by computer . Despite all these exciting specialities many hams enjoy the informal contacts, long discussions or “Rag Chewing”, or round table “nets”, whether by voice, Morse code, or computer keyboard. Even with the advent of the Internet, interest in amateur radio has not diminished in countries with an advanced communications infrastructure. This may be because hams enjoy communicating using the simplest hardware possible, as well as finding the most technically advanced way, advancing the art of radio communication at both ends, frequently beyond what professionals are willing to try to risk. Nonetheless, Voice over IP (VoIP) is also finding its way into amateur radio. Programs like Echolink, the Internet Radio Linking Project and app rpt/Asterisk use VoIP to tie hams with computers into radio repeaters across the globe. This nascent use is finding applications in emergency services as well, as an alternative to expensive (and sometime fallible) public safety trunking systems. Some critics point out that in traditional strongholds such as Japan, the United States and Western Europe, amateur populations are ageing Supporters counter that this merely reflects demographic reality in these ageing countries, and in any case is an ethnocentric position. In China and Eastern Europe, young amateur populations are growing rapidly despite equally unfavourable demographics, and young people are also flocking to the hobby in rapidly developing regions such as India, Thailand, Malaysia and the Arabian Peninsula. Throughout their history, radio amateurs have made significant contributions to science, engineering, industry, and the social services. For example, Guglielmo Marconi, founder of practical radio communications, often boasted that he was “only an amateur”. Other innovative hams have, historically, included Howard Hughes; Robert Goddard; David Hampton (‘Furby’ inventor) and many Nobel Prize winners. The economic and social benefit derived from amateur radio research has founded new industries, built economies, empowered nations, and saved lives. Amateur radio represents a unique research and development (R&D) opportunity for exploration and personal growth, nurturing research and hands-on education. This creates an environment for new technologies. Existing at the intersection of the social, economic, cultural and scientific spheres, some radio amateurs have used this position to invent and innovate from a unique perspective. Many now-commonplace communication technologies have their genesis from hams. Recent exponential growth in commercial wireless communication systems has taxed existing commercial spectrum allocations, and industry is eager for expansion. Some segements of amateur radio allocations in the UHF and microwave frequency spectrum are threatened in many countries. Historically, amateur radio operators, sometimes employees of large communications firms, are involved in the development of new communication technologies in underutilized portions of the radio spectrum. Amateur radio operators were the among the first, for example, to explore the microwave spectrum. A current, (year 2005) problem includes proposals by some companies to transmit internet data over power lines. Known as BPL, this technology can create significant radio frequency interference to a wide variety of other spectrum users. While the U.S. Federal Communications Commission appears to be sympathetic to the industry, many European regulators have demonstrated mixed views and Japanese regulators have rejected an application in that country. Amateurs have been responding to the threat by conducting substantial research, and by gathering evidence of the BPL system’s non-compatibility with many services including amateur and other commercial users of the medium wave, shortwave and lower VHF spectrum. As of 2005, field trials in the U.S., where the situation looks most problematic for hams, have generally been unsuccessful in meeting generally accepted radio pollution standards, and are often discontinued after brief attempts to attract customers. However, the threat to the amateur radio service has not been realized from BPL technologies, and, indeed, recent advances have actually been endorsed by the American Radio Relay League. leaving the viability of BPL to market competition rather than threat of widespread harmful interference. In a growing environment of wireless use, amateur radio’s place is assured, and continued leveraging of progress for wireless can only be sustained through such assurances. When travelling abroad, the visitor must hold a reciprocal license with the country in which she or he wishes to operate. Reciprocal licensing requirements vary from country to country. Some countries have bilateral or multilateral reciprocal operating agreements allowing Hams to operate within their borders with a single set of requirements. Through ITU agreement, frequencies have been set aside for amateur radio. From there, national telecommunication agencies decide which of the international allocations can be used within their borders. National amateur radio societies often have band plans to further divided those allocations, often by use. Amateur radio can be found throughout popular culture as a plot device. An example from Hollywood is the 2000 film Frequency. In it, the two main characters, a father and son (played by Dennis Quaid and Jim Caviezel respectively), communicate via amateur radio after the father has died. This is, of course, impossible, but makes a fine plot device. A wealth of additional information may be found at the main article link shown above. all thee time along with a cup of coffee. My spouse and i at the same time are the aspiring blog site article writer yet I’m nonetheless a new comer to the whole lot. Have you got just about any strategies for newbie weblog copy writers? I’d actually be thankful.